Low back pain is unfortunately not always corrected with spine surgery. The complex array of spinal fusion devises, hardware and surgical techniques have not improved success outcomes with spine surgery at the 50% success mark (failure?). Platelet-Rich-Plasma (PRP) a regenerative medicine procedure in which the patients own platelets are used to deliver growth factors to treat and repair injured body areas. 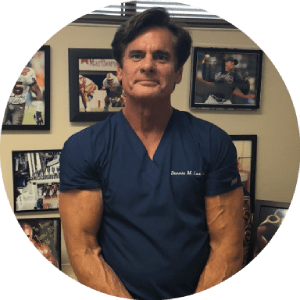 Platelet-Rich-Plasma has been used with success in a variety of musculoskeletal disorders and Dr. Lox has successful led treated many patients with chronic low back pain and failed surgery to the spine with PRP. 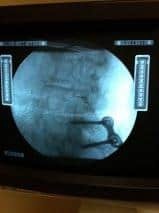 This is a fluoroscopic image of a patient with a one sided fusion that had persistent severe low back pain. The patient was treated successfully with Intrarticular facet joint PRP. The severe pain, restricted range of motion, and debility quickly improved. The resounding success is an illustration of how regenerative medicine can be used to treat low back and provide an alternative in cases to spinal surgery. Dr. Lox has used regenerative therapy extensively in his practice. Incorporating the body’s own repair processes that the platelets growth factors have, allows a healing response to occur that the body cannot effectively accomplish without the assistance of regenerative strategies. Many types of low back pain may be treated with this procedure, and the ability to avoid excessive medications and prevent further surgery that may be also unsuccessful, makes this a viable option for conservative care.